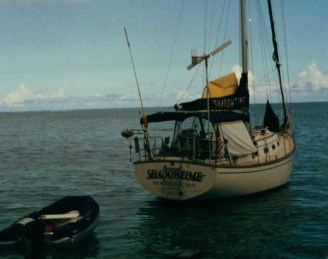 Living off the grid we did so for the entire eight years that we had our sailboat Shadowtime. Here you can see the wind generator, there were two 75 W solar panels on top of the Bimini... The canvas that covered the cockpit. This covered 95% of our electrical needs... With today's technology, and 150 watt panels, you can make 100% of the electrical power that you need... Solar panels are much more efficient than they were several years ago. We had a water maker aboard. We used single side band radios, and UHF radios for communication. The sewer was provided by the waves, currents and tides. We did our cooking with two 5 gallon propane tanks. We were totally self-sufficient from utility costs... This is a very easy to do on land as well. Let's review how we covered the five components of utilities while on the boat. Phone service... we called our friends, listened to weather reports, on the single sideband radio... For closer calls we used our VHF radios. You can always find a pay phone for phone calls. Sewer... In the Caribbean your allowed to discharge waste (not garbage) directly overboard... You would need a septic system on land. Water... Freshwater is precious on a sailboat... Our 90 gallon tank would last us for two weeks, a shower a piece a day, our drinking water, and water to do the dishes. A well would suffice on land. Cooking...Our 5 pound propane tanks would last a long time. In rural areas a larger propane tank would meet your cooking needs. Some folks use propane for refrigeration. Electrical power... With today's high output solar panels, you would not need a wind generator on a boat... You could use both on land. Today there are many ways to be self sufficient. Almost any place you would choose to live a well, a septic tank, cell phones and propane are readily available. Recently I met a 60 plus year old cowgirl living on a small ranch by herself in eastern AZ...she cooks on a wood stove, gets her water from rainwater she collects from her roof, and is living very happily and cheaply. She is quite content, pays cash for everything she needs and smirks at the mention of a utility bill...good for her.